KEB Hana Bank PLACE 1 is a newly remodelled bank and office building located in Samsung-dong district, Seoul, South Korea. The interior design of the building is unique throughout the entire building. 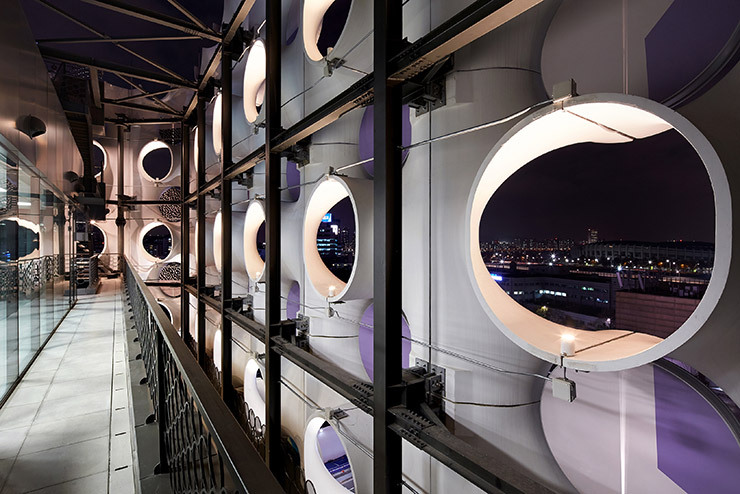 Each floor has its own designated purpose such as a library, café, and offices. This reflects the different characteristics and needs per floor, which is then associated with a particular biome and material to go hand in hand. A myriad of materials such as concrete, wood, ceramic, and stone were used to portray and mimic what exists in nature, such as a forest, cave, marshland, and tundra environment. 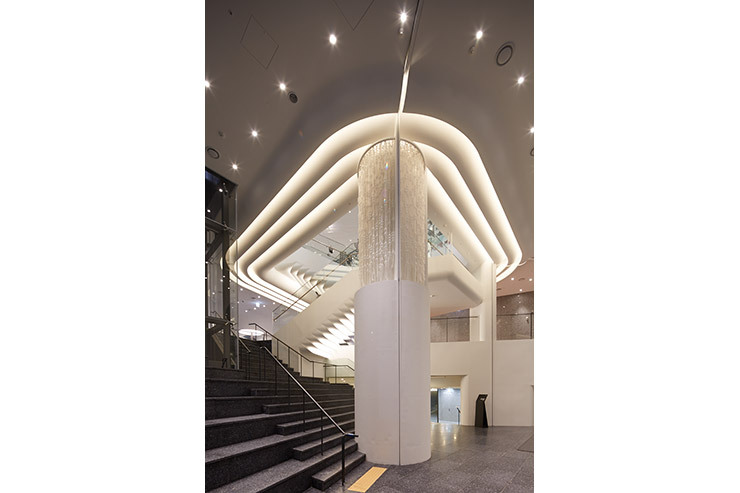 Lighting plays a key role to illuminate these distinct areas of the building and to preserve the textures and patterns, yet keep the interior looking cohesive and consistent throughout the entire building. Instead of using the typical wall grazing and wall washer fixtures to emphasize the different surfaces, indirect lighting and downlight was used. 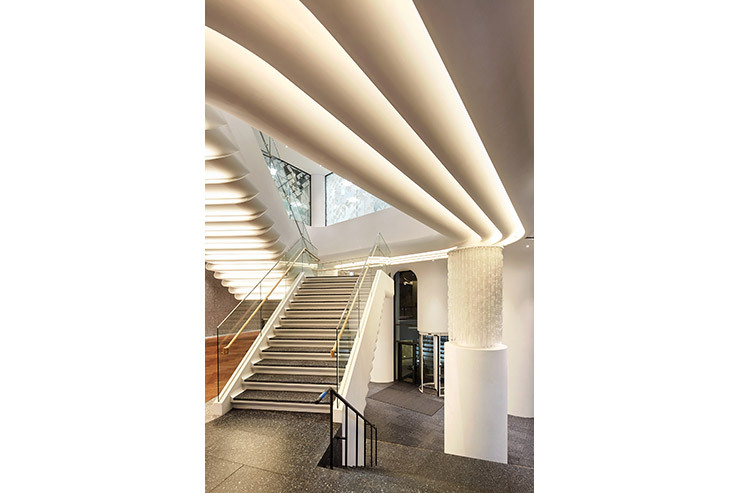 Linear indirect lighting was used to follow the pattern and structure of the building interior. The lobby in particular has a mixed medium of wood, marble, and stone floor of different colours and the walls and ceiling are made of concrete and marble. 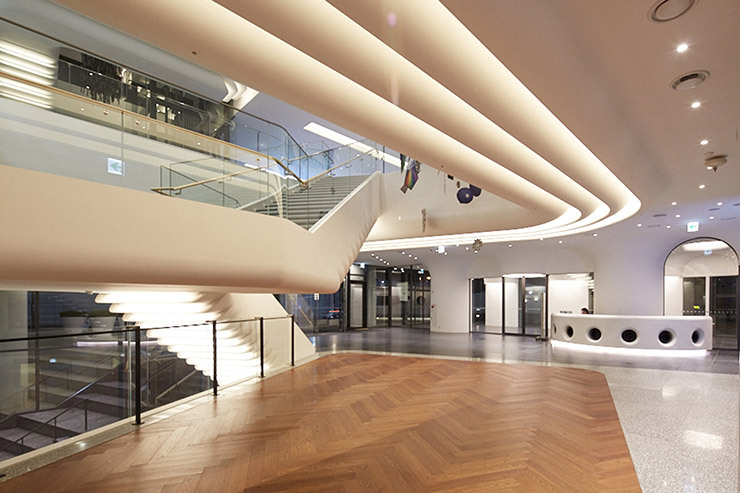 The usage of downlights and cove lighting casts subtle and soft light that allows the materials to be differentiated by the eye and coexist in a single space. 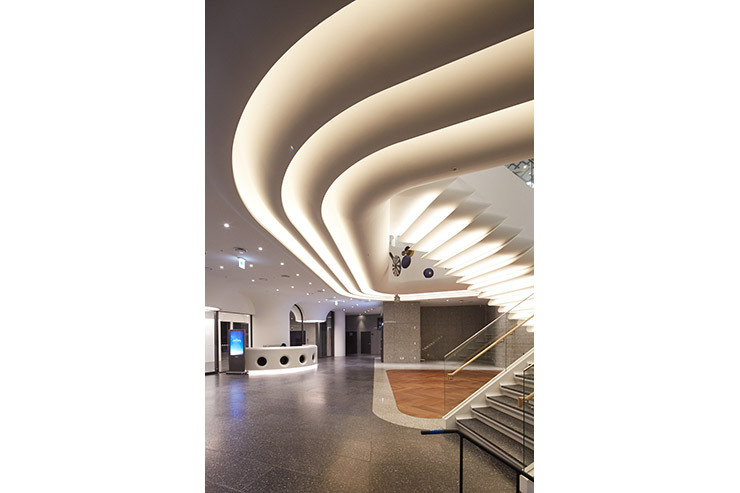 Linear cove lighting was implemented to follow the pattern and structure of the building’s ceiling. It also helps to prevent glare for those who are occupying the building during the day and at night. The same linear lighting can also be seen on the underside of the staircases instead of on the steps themselves. This creates a functional and aesthetic purpose as well, in which the pathway is well lit for the safety of users through carefully thought out lighting design. 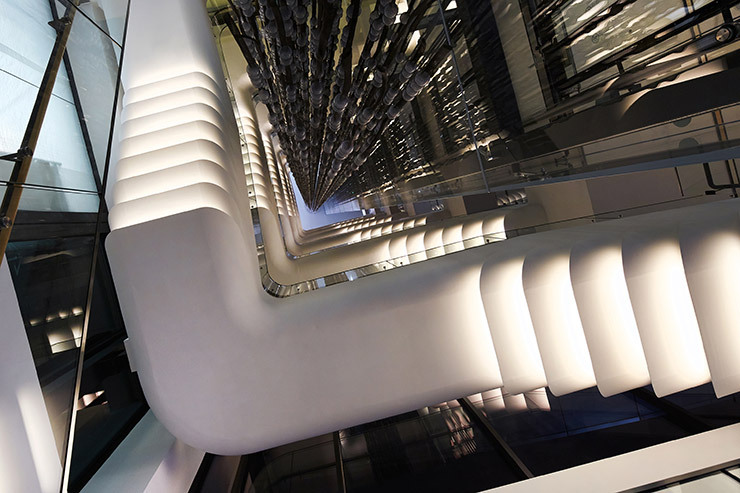 Also, the open slow core staircase can be seen from the first floor until the ninth floor, creating a natural maze-like pattern when looking upwards. This reinforces the concept of reiterating patterns within the interior of the building just as the exterior of the building. Different lighting techniques and fixtures were used to illuminate the underground parking lot for safety around cars. 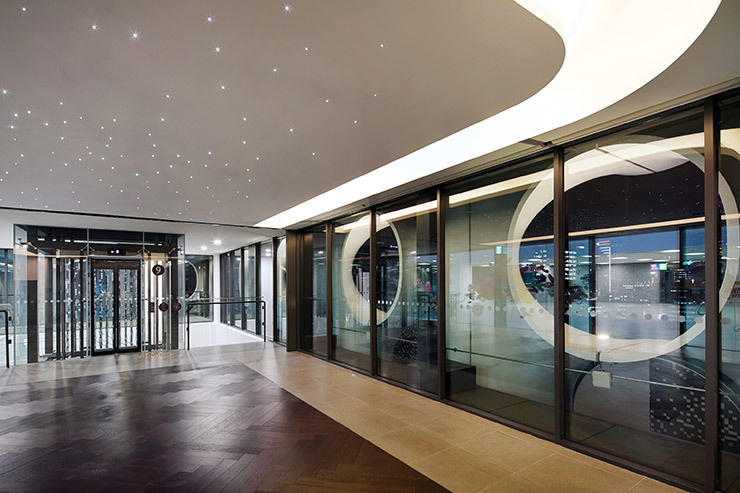 The ceiling has large circular fixtures that mirror the architectural pattern. The floor in particular has L-shaped LED patterns on the floor to indicate parking spaces, making an otherwise dark area into a well-lit and informative space. 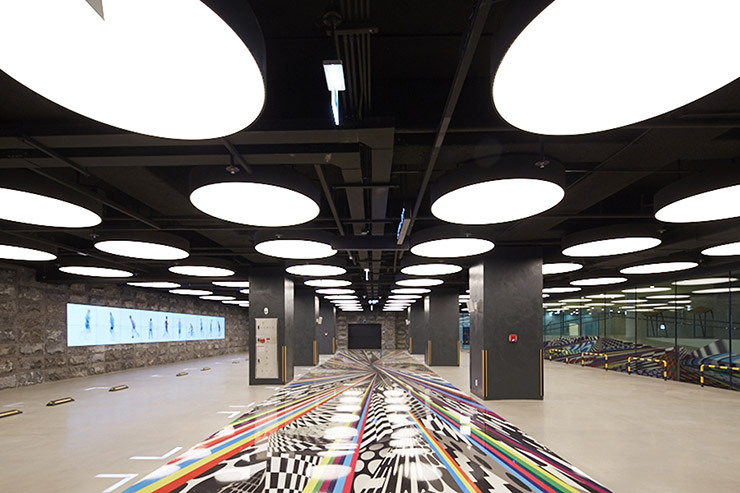 The modular architectural pattern is reiterated within the surrounding corridors with its arcs and ovals. 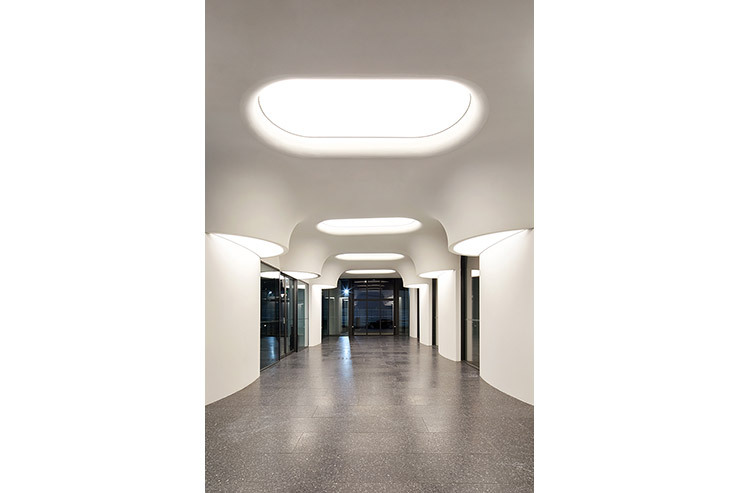 The indirect lighting creates a soft glow that matches the concept of using downlight and indirect light throughout the building.